Update: It looks like stock for the online store is depleted. If you've got a Fry's store near you, you might still be able to select in-store pickup. Here's a list of retail locations. Happy Labor Day, Americans! Today is the day we celebrate unwise imbibing on a three-day weekend, billion-dollar retailers hosting sales that ironically force many of their employees to work, the nigh-limitless lobbying power of unions, and oh yeah, laborers. But you can take advantage of this very small deal on a 16GB Class 10 MicroSD card from Fry's even if you have to work, thanks to the magic of online shopping. 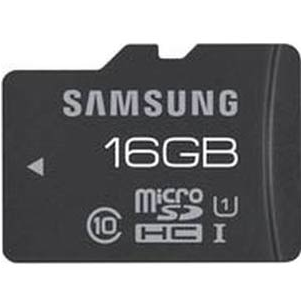 Fry's Online is offering this 16GB Samsung Class 10 UHS-1 MicroSD card for a rock-bottom $7.99, with $1.99 "Ultra Saver" shipping to the United States. It includes a handy standard SD adaptor for use in cameras and the like. Faster shipping options are available, and if you happen to live near one of Fry's massive retail stores you can select in-store pickup. Similar cards start at about $14 on Amazon, and considerably more at other stores. If you're wondering what makes this particular card so special, that Class 10 Ultra High Speed rating means that it can read and write at 10MB per second. These types of cards are usually designed for quick shooting on DSLRs or high-definition video, but can also come in handy if you keep apps on your MicroSD card. Samsung and a few other manufacturers have begun to support this since Google removed the native Apps-to-SD feature in Jelly Bean, including NVIDIA's most recent update to the SHIELD. The Samsung card will return to its regular retail price tomorrow. We haven't been able to find similar deals on any other cards during Fry's Labor Day Sale. 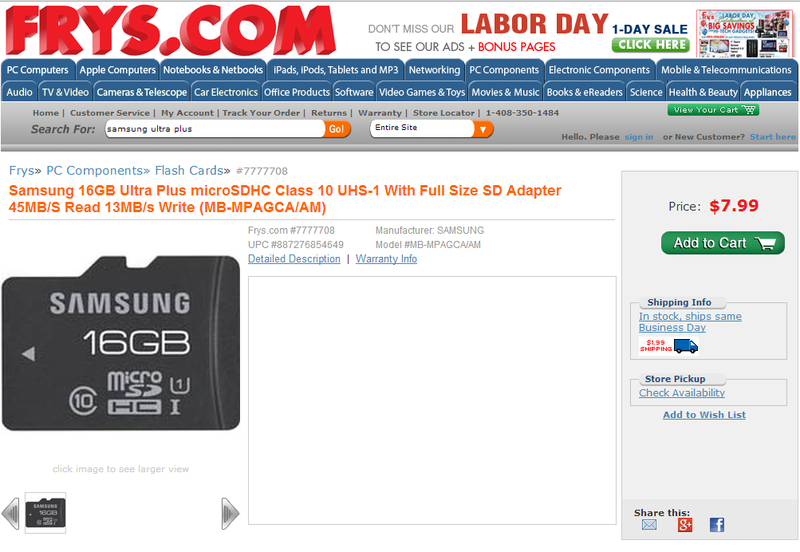 If you're looking for something a little more capacious, Amazon has a SanDisk 32GB Class 10 card for $24 at its regular price.